TIG welding uses a non-consumable electrode, which produces the arc, creating the heat required to weld (melting and fusing the surface of the metals being joined). The electrode does not melt during the welding process. The filler rod is fed into the weld area by hand, as it is required. The protecting gas is usually argon and this prevents contamination from gases in the air. This type of welding is ideal for thin sections and is used on metals such as stainless steel. Other metals that lend themselves to TIG welding are; copper, aluminium, titanium and mild steel. 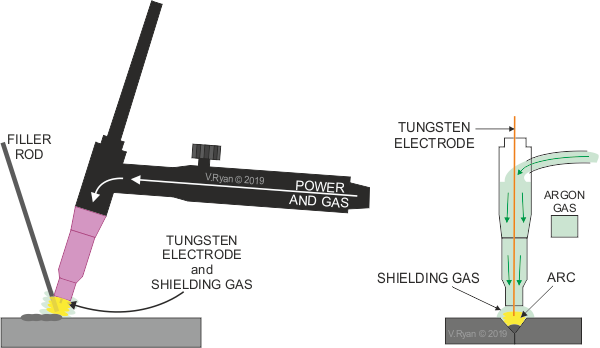 Lower current / amperage is required by TIG welding, but it is slower than MIG welding. However, it produces very accurate welds, allowing quite integrate work. 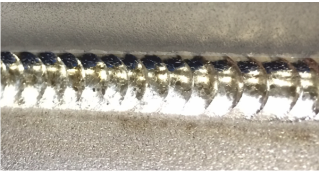 TIG produces very clean welds and does not result in deposits on the surface. As TIG welding takes place at lower temperatures, the metals being welding suffer much less distortion.